You guys know I have a love for hairpin legs. I've used them on my Mid-Century Industrial storage unit, on my Hairpin Leg Vanity, and I've even shared a tutorial how to make your own DIY hairpin legs. A few months ago I was browsing through Osborne Wood Products site and was blown away to discover they have started selling hairpin furniture legs! I've worked with Osborne many times and have always been super impressed with their products, so when they asked if I wanted to try out a set, of course I said yes. It kinda came at a perfect time. 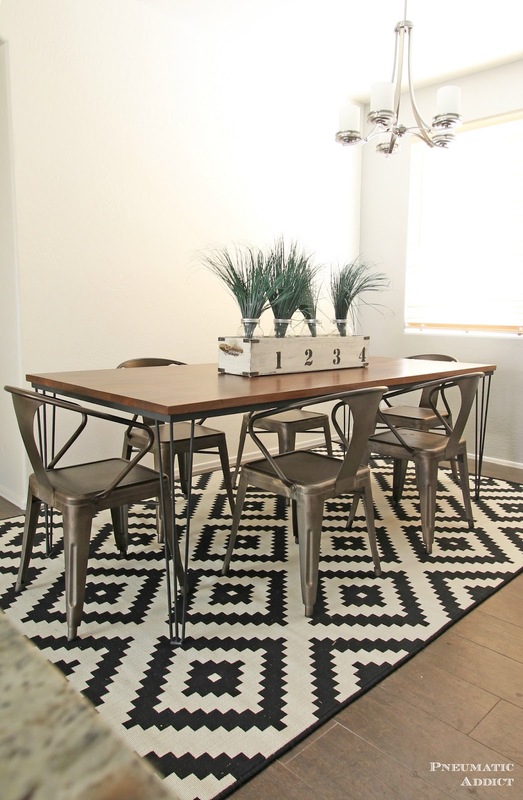 We have just moved into a new house and I was itching to build us a new dining table. 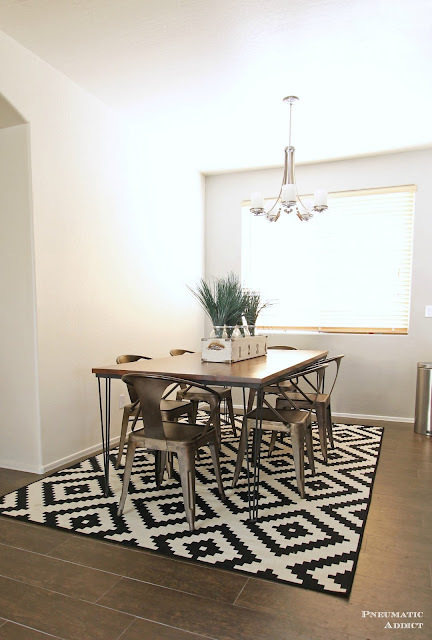 I loved my Industrial Farmhouse table a built a few years ago, but it was time for something new. I came upon a potential problem. 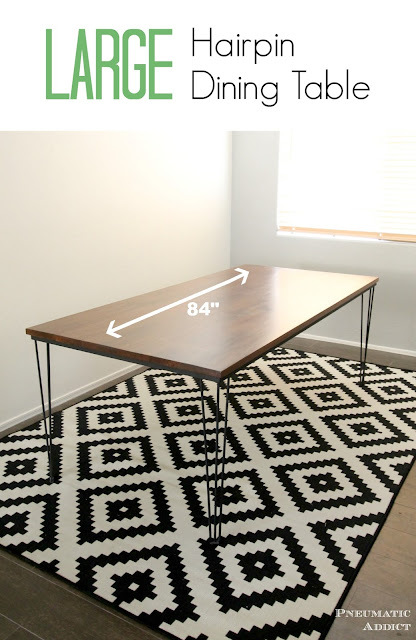 I knew I was going to use hairpin legs, but I also knew I wanted a ginormous table, like 7 feet long. This could pose a potential problem. Unlike a traditional table where the aprons distribute a lot of the load, most of the time you just screw hairpin legs through the mounting brackets, right to the bottom of the table top. Well, using The Sagulator, I calculated that I would have to have a table top around 2" thick to not sag in the middle. Not only would that be difficult to build and look strange on dainty legs, it would create so much weight, I wouldn't feel comfortable mounting it on top of thin steel rods. Like I've done many times before in the past, instead of building a table top, I hit up Craigslist for a donor table. I was able to find a 38" x 84" table in admittedly rough shape, but with a solid, 1" thick top. I ditched the legs and busted out the *belt sander. After a couple hours of striping and sanding, I had my ginormous, solid wood table top and it only cost me $80. 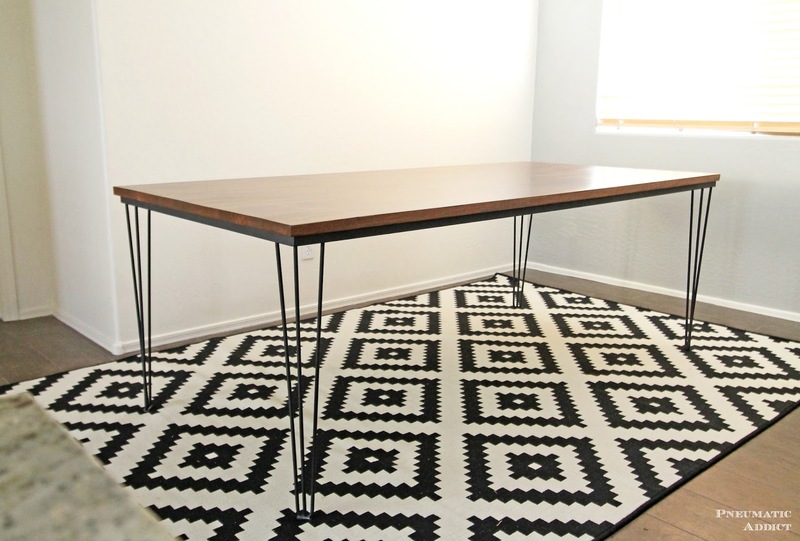 Not wanting a saggy dining table, my next step was to create a steel sub-frame to give additional support. I picked up three, 8 foot lengths of 1" x 1/16" angle iron from my local Industrial Metal Supply, but you can find the same stuff at Home Depot. 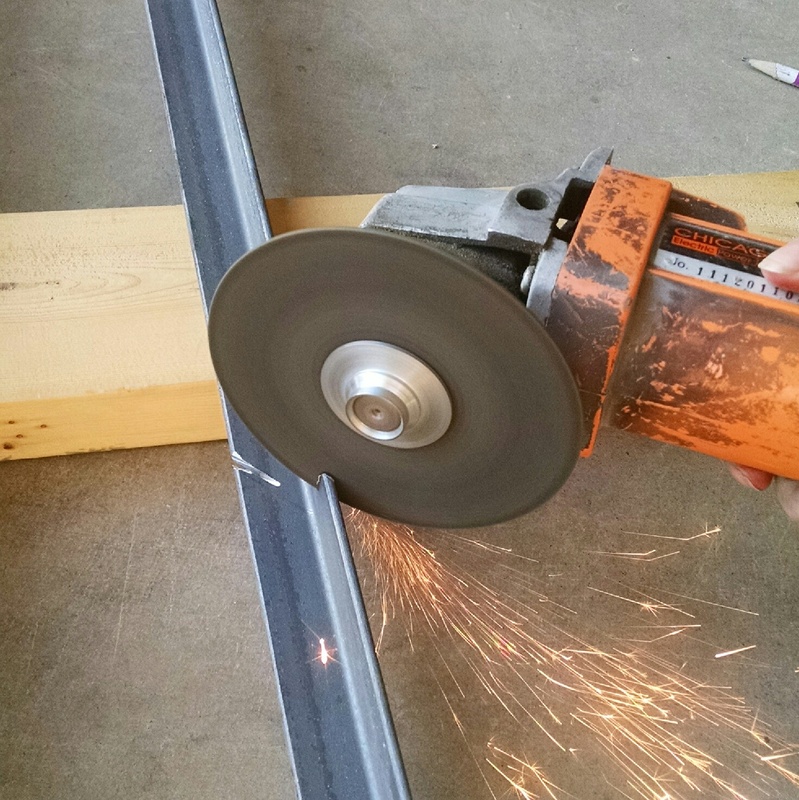 Using an angle grinder, I cut two, 82" lengths and two, 36" lengths, mitering the corners on each end. I then created a rectangular frame and welded the seams. If you don't have a welder, I'd suggest looking up a local metal fabricator and getting a quote. I talked to a welder friend of mine and he said he would only charge around $20 to weld a frame like this together. 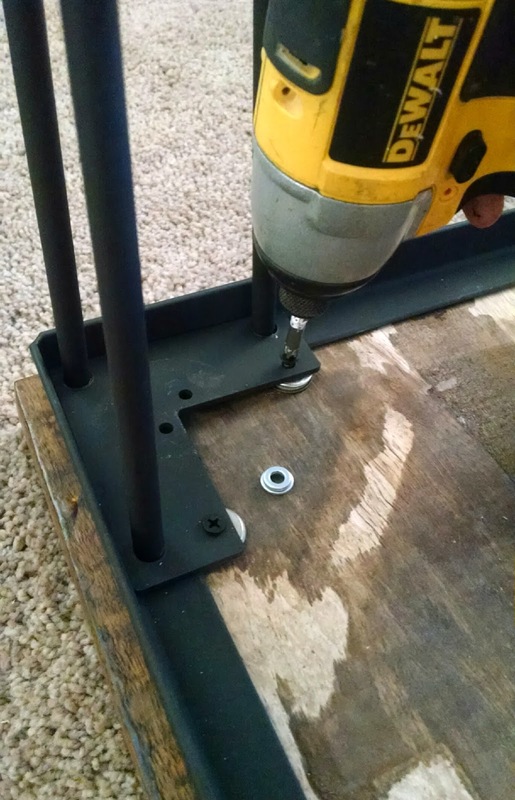 Once the frame was together, I pre-drilled holes every 18", using a 1/8" metal specific drill bit. The frame then received 3 coats of *matte black spray enamel , followed by 2 coats of *matte lacquer . 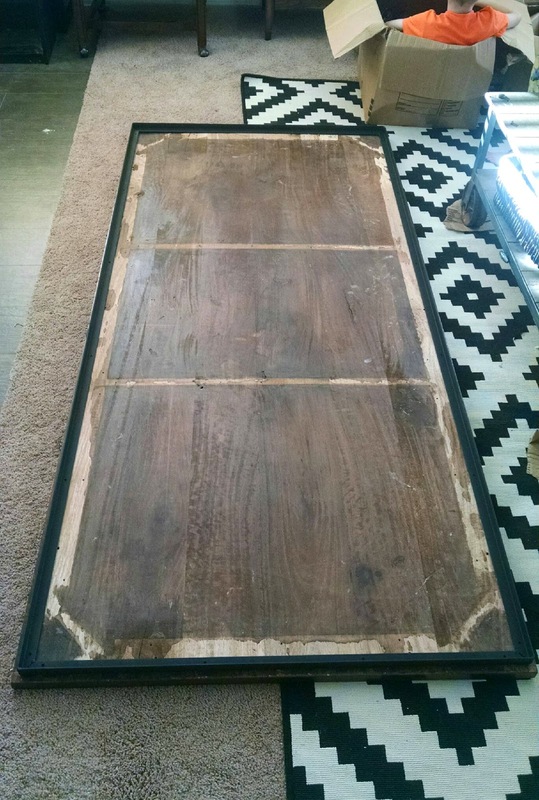 I flipped the top face down on my carpet and aligned the frame 1" from all four edges and screwed it into place using 3/4" wood screws. Next, it was time to attach the hairpin legs. I placed the legs all the way in each corner of the frame. The thickness of the frame created a small gap between the leg bracket and the bottom of the table top. To fill the gap, I stacked a couple small washers, then drove 1" long wood screws through the pre-drilled holes. I flipped the whole thing over and my table was basically done. If your table if going to be resting on hard flooring, like mine, you'll probably want to make yourself a set of rubber guards. 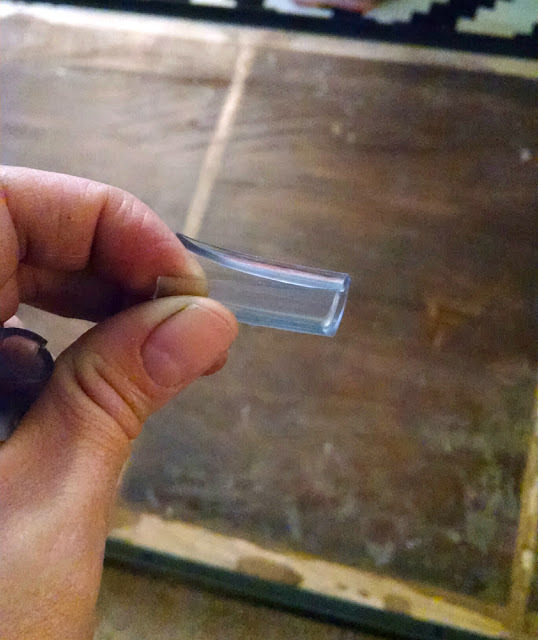 I picked up 1 foot of 3/8" clear tubing from True Value for something like $0.40. I used a utility knife to cut four, 2 inch segments and sliced them down the middle. I could then easily slip them over the point of each hairpin. And here's the finally result, sitting in its new home. I still have my *gunmetal Tabouret chairs I ordered a few years ago. I still love them, but I think I may switch them out eventually. Here's how the table looks au naturale. You can't really get an idea for scale, but this thing is large and in charge. I can fit 8 chairs comfortably and 10 if we needed to. I love having all the space and no hint of a sag. What do you think? Ready to make your own? Feel free to pin the image below. *This post contains affiliate links and sponsored content paid for by Osborne Wood Products. All opinions are my own and have not been influenced. Gorgeous!!! I love this table. I am impressed.